As Christians should know that Divine Healing is for today. The Basic Course of Divine Healing book is the book to have if you have a desire to learn how to pray for the sick. An 84 page training manual. Obviously, John G. Lake loved the Lord and believed the Lord for divine healing. The Lord anointed him with a powerful healing ministry. As he started the healing rooms in 1914 in Spokane, Washington, many people received divine healing through the basics Course of Divine Healing. John G. Lake prayed for the sick on a daily basis and became overwhelmed by the massive number of people that came to him for divine healing. He realized he could not continue to do this himself. Later, he started a healing school to train other Christians how to heal the sick by teaching them what the Word of God has to say about healing today as well as faith and believing that Jesus would heal the sick. Just know we all have been commissioned to pray for the sick. All you need to have is faith and an burden to pray for others. 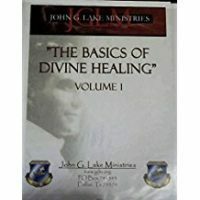 John G. Lakes became known for the Basics Course of Divine Healing.